PARIS: After the third round of the women’s single’s division of the French Open, there are only a handful of familiar players, but there are a lot of new players that are advancing to the finals. After ending the third round of the men’s singles division of the French Open there are what I call the “usuals,” those familiar players who have advanced to the finals in numerous tennis tournaments. 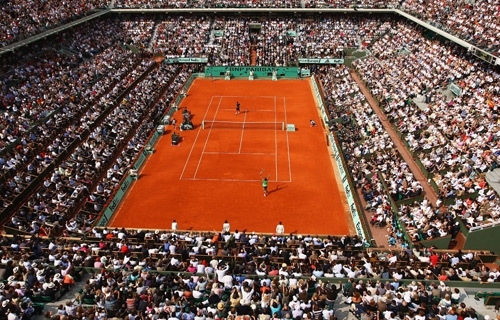 PARIS — Rafael Nadal improved his record at Roland Garros to 42-1, beating Ivan Ljubicic 7-5, 6-3, 6-3 on Monday to reach the quarterfinals of the French Open. The five-time champion was not troubled on Court Philippe Chatrier, and the win kept him on course to equal Bjorn Borg’s record of six titles on the Parisian clay. Novak Djokovic also had a successful day, even though he wasn’t scheduled to play. The second-seeded Serb reached the semifinals of the tournament — where he will meet Roger Federer. Fourth-seeded Andy Murray defeated Viktor Troicki of Serbia 4-6, 4-6, 6-3, 6-2, 7-5. Nadal won four straight titles at the French Open before losing to Robin Soderling in the fourth round in 2009. He will face Soderling in the quarterfinals this year. In an on-court interview after he eliminated Simon, Soderling was told that some people — including, as it happens, Nadal himself — are saying the five-time champion isn’t at his best. That drew a comment of “I hope not,” and an accompanying chortle from Soderling. Federer won the 2009 Open to complete a career Grand Slam, but Nadal returned to win his fifth title in 2010. Djokovic, who will not be credited with a victory because Fognini withdrew, is after his own records. If he wins his semifinal match, he would equal John McEnroe’s Open era record of 42-0 for the best start to a tennis season and clinch the No. 1 ranking. With three more victories, the second-seeded Serb will match the record of 46 straight wins set by Guillermo Vilas in 1977. The two-time Australian Open champion has never won the title at Roland Garros, but he beat Nadal in two clay-court finals leading up to the French Open. Juan Ignacio Chela also reached the quarterfinals. The unseeded Argentine, the only non-European left in the men’s draw, beat Alejandro Falla of Colombia 4-6, 6-2, 1-6, 7-6 (5), 6-2.